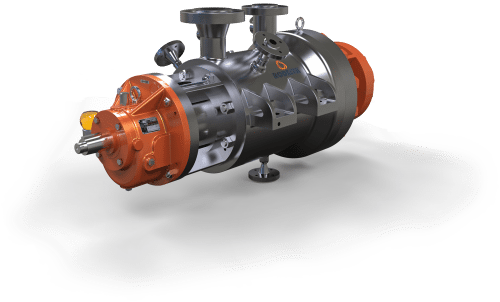 The BB4 type, KBSH and KBDH pumps are single casing, radially split multistage between bearing pumps. The design and manufacture is as per company standard but can meet API610 requirements. 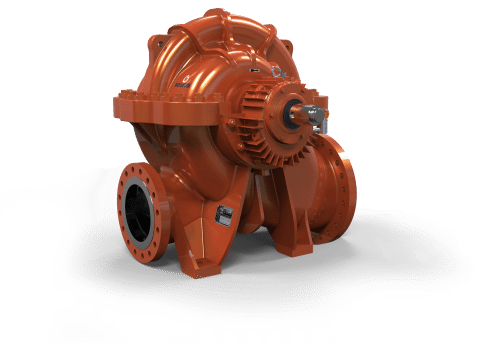 These pumps are suitable for wide applications in High pressure boiler feed water applications, high pressure mine drainage applications, high pressure applications in water treatment plant. 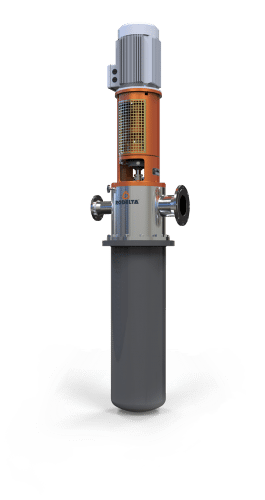 The discharge pressures are designed up to class 1500 and suitable for suction pressures up to 16 bar (g). For alternative specifications contact us. Design and manufacture as per company standard but can meet API610 (BB4) requirements. Easy inspection and repair maintenance of bearings and mechanical seal after removal of coupling spacer only. Multistage pump with ring section diffuser casing design with centerline support to meet high temperature and high pressure applications especially in BFW applications. Pump with cartridge type mechanical seal at Driving end and Non driving end as per API682. 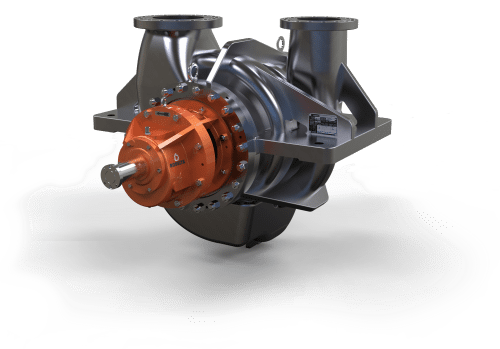 First stage impeller with double suction is provided in KBDH models to improve NPSHR performance. 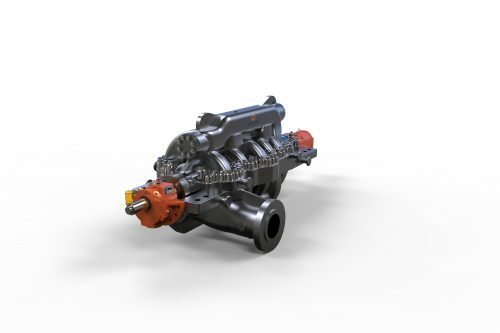 Specially designed to meet high performance for superior and extended low cost operation. 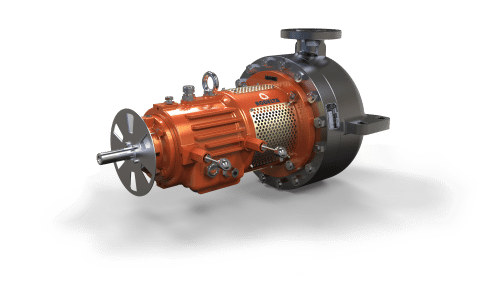 Pump family designed to have maximum parts interchangeability. The casing is multistage ring section, single casing, diffuser type centreline mounted on sturdy support pedestals. The discharge casing is a structure prudently designed and fabricated of carefully selected material for high temperature and high pressure services. Particularly the balance chamber is of a unique construction achieved with year’s long experience. The tests are secured at shaft centre for freedom from thermal effects. 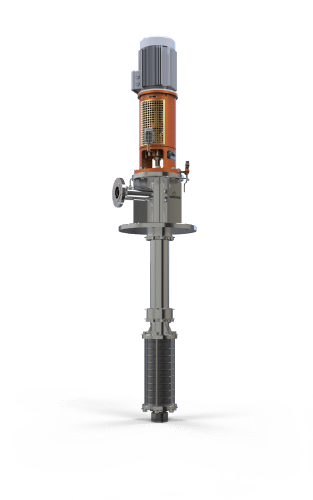 Inter stage Casing is simplified in construction for freedom from thermal deformations, and is overall finished for minimum frictional loss in fluid. The interfaces at the respective stages are super finished for perfect seal without packing used. 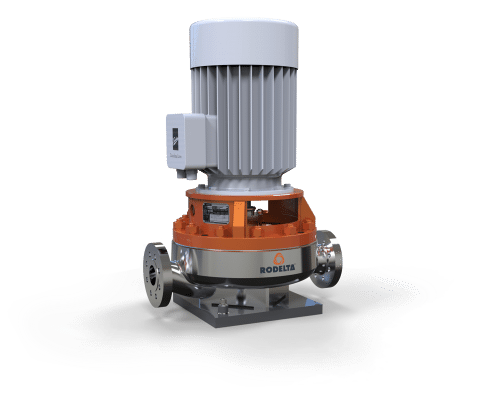 Rodelta can also provide casings which are designed for maximum allowable working pressure and 2 times API nozzle loads and if required Rodelta can also provide casings which are designed for maximum allowable working pressure and 4 times API nozzle loads. If required Rodelta can also provide steam tracing/insulation to the casing, when high temperature application is involved. This is to avoid unwanted heat transfer or to avoid any accident/hazard due to high surface temperature of casing. 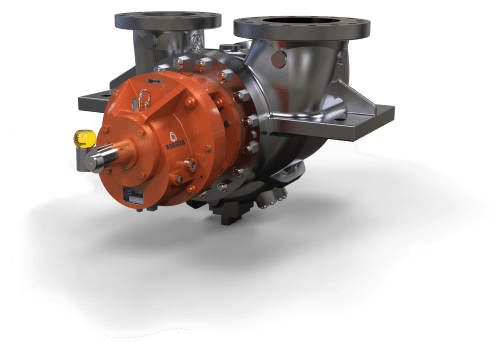 Suction & discharge nozzles are designed in Top-Top configuration. Suction nozzles are available in 150/300 class flange rating as per ANSI B 16.5 whereas Discharge nozzles are available in 300/600/900/1500/2500 class flange rating (as applicable depending upon maximum working pressure). Flanges of suction & discharge nozzles are raised faced with a serrated finish. Nozzle loads are physically tested at our test bed centre by applying forces. Top-Top nozzle arrangements, a tapped and plugged vent is included in Rodelta’s scope of supply. Drain holes are NPT and vent sizes are NPT. Seal circulation lines are ½” NPT, irrespective of discharge sizes. All provided connections are shipped with plugs made of materials compatible with the casings, unless otherwise specified. Additional connections can be provided for Quenching, Cooling water inlet & outlet & Warming line when specified. Liquid gasket is employed for sealing. Stuffing box is deep enough to accept various seal designs including tandem and double seals. Water cooled or Jacketing stuffing box designs are available at extra cost when specified or required. Cooling arrangement is provided for stuffing box depending upon the pumping temperatures. The impeller are of closed type, finished overall that a maximum hydraulic efficiency can be obtained. They are perfectly balanced, both dynamically and statically. The impellers are all located in one direction, with thrust balanced by drum. Impellers shall not be individually located along the shaft. Impellers are balanced individually as per ISO 1940 Gr 1/Gr 2.5. If required Non – destructive like dye penetrant test on Machined surfaces or Radiography test can also be provided on impeller. The impeller wear rings are held on impeller with an interference fit and secured in positions with set screw to ensure positive fitment. The case wear rings are inserted in the casing and the gland cover with a interference fit and secured in position with set screws. Note: – wear ring flushing arrangement can also be provided when solid particles are present in operating fluid. The hooked shaft sleeve is axially secured against a shoulder on the shaft by the impeller nut and keyed to prevent radial rotation. The shaft sleeve also extends beyond the seal end plate to positively identify seal leakage. A gasket is provided between the sleeve and the shoulder on the shaft. Bearing housing is horizontal split type for easy removal of bearings for inspection. The antifriction bearings are lubricated through an integral splash type system accompanied with oil ring. Radial bearings are Sleeve type bearing and thrust bearings are angular contact ball bearing in back to back arrangement or tilting pad are provided as standard. The bearing housing has an extra large oil reservoir to provide sufficient oil capacity. Oil level control is done by constant level oiler at DE & NDE brg. Housings. 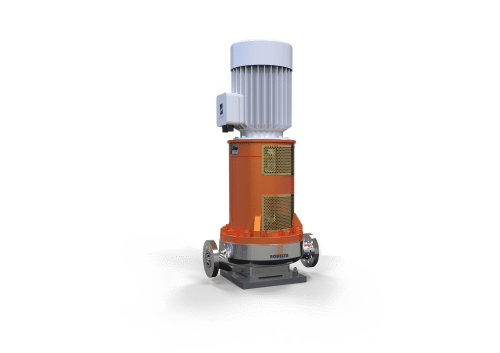 It is furnished with a constant level oiler which includes a mechanically lockable adjustment and a protecting wire cage. The following optional features are available at extra cost. Requirement of cooling to bearing housing basically depends on pumping temperature and the linear velocity of bearing sleeve. Axial thrust generated by the pump during running condition is balanced completely by balancing disk and drum arrangement. Self-Balancing – The balance chamber is connected to the suction casing by pipe. 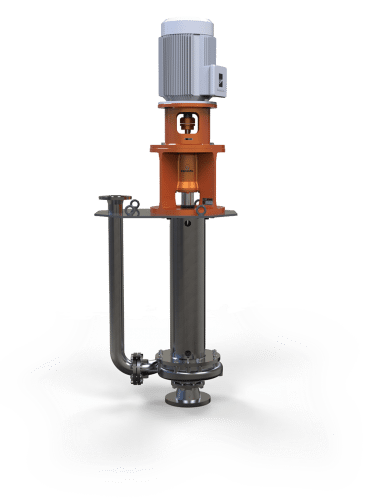 External Balancing – The balancing chamber is connected to the deaerator through a squeezing valve and pressure relief valve. 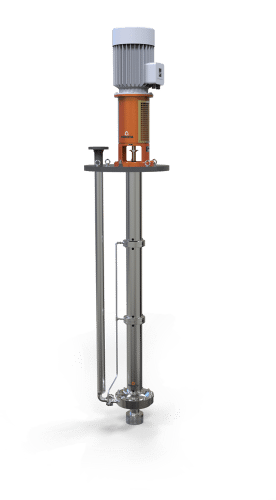 The balancing method to be adopted shall be decided based on the suction pressure and the temperature rise in the balancing chamber at minimum flow. As a standard oil bath lubrication is provided to lubricate the bearing. In case of tilting pad bearings (hydrodynamic bearings) forced feed lubrication is provided. Lubrication system comply the latest API 614 chapter 2 & chapter 3 and also can fulfil customer specific requirements. Lube oil tanks are supplied separately mounted on base plate. Lube oil tanks can also supplied with in-built baseplate. Lubrication oil used is ISO VG46. Inter stage tapping can be provided to accommodate LP & HP flow. 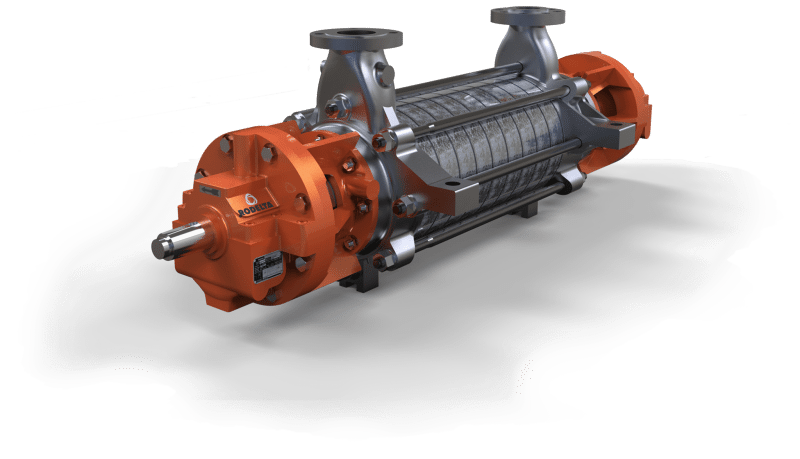 Lift out devices for axial lifting is not required in these pumps. Metal to Metal fit is without confined controlled compression gasket or O ring. High pressure applications in water treatment plant. 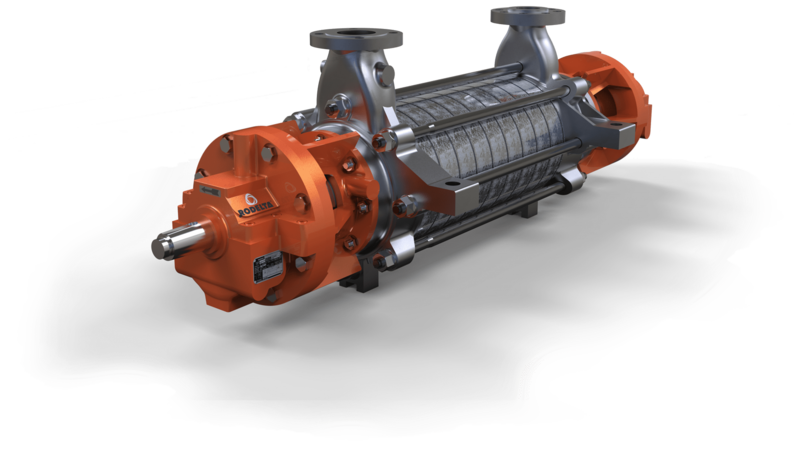 Pump as hydraulic power recovery turbine in water treatment plants.